I spent my morning yesterday with women. Women physicians. Women physicians in leadership. Women physicians in leadership and Tammy Hughes from the Heim Group. If only the first sentence were true, my day would have been unusual for me. By sentence #4 things got excellent. Some amazing women physician leaders in my organization, Kaiser Permanente, included me in a room of people that left me in awe. Dr. Barbara Carnes and Dr. Amy Wolf, 2 simple words for this. Thank you. In 1997, as a senior resident in orthopaedics, Dr. Bettina Gyr, a woman attending in pediatric orthopaedics, set this story in motion. She was new to Texas Children’s Hospital and new to practice. She invited me and the other woman in my program over for dinner, Each time a woman entered year 4 or 5 in the program, another woman was accepted. Mostly 1 woman at a time, with a year of overlap. The woman who came before me, Dr. Elizabeth Magnabosco, then Elizabeth Dyson, set the bar high. Higher than high. Not only was she a great surgeon, she was a great doctor, a great communicator, and a great friend and person. She didn’t get the memo that when 2 women are surrounded by men that they often don’t stick together and have one another’s backs. I lucked out with her. But she was gone and graduated before I even know how to fix an ankle (the most basic orthopaedic surgical procedure). When Dr. Bettina Gyr invited us over for dinner, she gave each of us copy of a book called Hardball for Women. I read it, and learned from it. I put it away, remembered the book but not where I got it. In 2012, my mother made a dear friend named Dr. Pat Heim. They met in the PLATO society, a group of mature overachievers, who gather for “student discussion groups.” They are retired lawyers and academics, doctors and authors. They keep up with my mother intellectually, something that we all aspire to, It turns out that Dr. Pat Heim wrote that book, Hardball for Women. And when Bettina Gyr and I saw each other at a conference later that year, I remembered her long ago gift and thanked her. 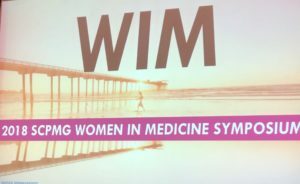 Yesterday, when I attended the Kaiser Permanente Women in Medicine half day symposium for women in leadership, and I heard our keynote speaker, it took me nearly an hour to put together that Tammy Hughes is the president of Pat Heim’s group. She spoke about the different lenses worn by men and women, the ingrained differences in behavior and feedback that differ by gender, and the implications this has in working together successfully. That 1 woman acting like a man is not diversity. That 2 women in a board room full of men are unlikely to sit near each other and collaborate, it takes 3. What pearls she dropped, over and over and over again. And what a full circle she created for me. The power of Tammy Hughes’ talk synthesizes for me today, as I ride a plane to Hawaii, about to lecture at my all-time favorite event, Aloha update. Children’s Hospital Los Angeles kindly rotates me onto the faculty of this course for pediatricians every few years. I take some time out from practicing and polishing my talks to watch “The Post.” I am blown away. Meryl Streep’s character, KatharineGraham, is a case study in the challenges of the history of women in the board room. The grace, the poise, the “feminine” attributes present as the story begins are cringeworthy as her weakness, her achilles heel. Yesterday, I learned the word “codeshifting” from Dr. Christina Kim, a superstar dermatologist. I have always used the word “shapeshifter” and “chameleon.” As I climbed to the stage after Tammy Hughes’ talk to bring the group through a “wellness break” of yoga, I acknowledged to this crowd of uber successful women that I was aware that an orthopaedic surgeon leading yoga could not better exemplify this notion of “codeshifting”. In “The Post” we see Meryl Streep’s character code shift from feminine dinner hostess, articulate and flattering and beautifully put together, to her board room self. Men in the board room speak her ideas and take her credit. She quietly mutters quick and correct answers to important arithmetic questions, and is ignored, As a viewer of the movie and mentor of women, I am wounded for her. And mad at her for not speaking up, as she had at her dinner party. I laugh and cry at the same time as the man sitting next to her is asked to answer the same questions, and gives the same numbers with confidence, followed by distinct acknowledgement. What makes her perfect as a dinner hostess to America’s then elite aristocracy does not make her successful as their professional leader in any way. As the story unfolds, Katharine Graham’s character strengthens and grows. She is shown with her daughter and grandchildren, gathering strength in her bathrobe alongside her sleeping grandchildren. She quotes Samuel Johnson, “Sir, a woman’s preaching is like a dog’s walking on his hind legs. It is not done well; but you are surprised to find it done at all.” Her self awareness is moving. She then shifts. She moves to exhibit bravery, she exemplifies a collaborative style concomitant with decisive action. The respect and support of many of the men she leads is hard won and complete. Her courage does not make her into a masculine version of herself. She remains poised and gracious, kind without being nice. Steven Spielberg has given a case study to Pat Heim in his masterful telling of this story, that time when United States press was saved by a woman. As Supreme Court Justice Hugo Black wrote, “In the First Amendment, the Founding Fathers gave the free press the protection it must have to fulfill its essential role in our democracy. The press was to serve the governed, not the governors.” The year was 1971, Judge Hugo Black died in 1971, and this was the year I was born. This rare film that celebrates women with strength and as full, rounded heroines is at its best here. In today’s #metoo reality, Mr. Spielberg also gives us a history of #heforshe. So thank you to Pat Heim, Hardball for Women, Bettina Gyr, Tammy Hughes, Steven Spielberg and, most of all, Drs. Amy Wolf and Barbara Carnes, for allowing me to come full circle in my now enhanced understanding of women in leadership. Wonderful piece. Putting real life into words out into the atmosphere. Well done! There are so many feels here – so many circles – full and overlapping and concentric – most importantly the circles are getting bigger for us because of women like you. You are becoming the women who inspired you – I am sure you do not realize that or believe that – but from 35,000 feet up – it is happening. Thank you for this – thank you thank you thank you! My 8 year old daughter and I just read this together. Thank you for your kind words and for making me proud this morning. Wow, Jen. Amazing piece. And thank you so much for your kind words… I wish I had been able to be there more for you. You have become an amazing leader of not just women surgeons, but women in general. Proud to call you my friend and colleague. I am glad you read this! Your mere existence made my residency a better world, you were there from afar!! Wow!! Excellent!! You write so well!! I couldn’t stop reading. Thank you!! Glad you liked it. Hey Jen! Great piece. I loved The Post. I have another one for you if you haven’t seen it yet. It’s the Ruth Bader Ginsburg documentary that just came out on iTunes. Worth the purchase. It’s called RBG. Her story, what she did for equal rights as a lawyer and judge, incredible. Her marriage was ahead of it’s time as well. I know you will love it. I’m still thinking about it. And she is funny! Thank you for reading this, Chris! The compliment means so much coming from you. We will watch RBG this weekend. Saw your funny IG post on this. Need some CB movies to add to my list, too.